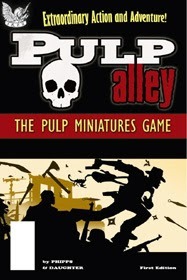 Statuesque Miniatures is pleased to announce we will soon be stocking the Pulp Alley rulebooks and playing cards. With a European retailer for the games, it will be easier and cheaper for Pulp Alley fans on this side of the Atlantic to get their hands on the printed copies of the game. Pulp Alley is a pulp-themed miniatures game, with all the rules you need to bring dashing heroes, dastardly villains, and pulse-pounding action to your gaming tabletop. Pulp Alley plays at the pulse-pounding pace of your favorite pulps and serials. Characters are easy to create and customize, making each league unique. Players never need to consult charts during a scenario. The action is on the tabletop – not in a rulebook. Control of the Initiative is based on events as they occur during the scenario rather than an arbitrary die-roll. Fights are fast-paced and simultaneously dangerous for both characters, instead of the old I-shoot-then-you-shoot sequence. Perils and challenges are unpredictable and offer multiple paths to success. Scenarios are plot-driven, encouraging action, and offering an array of different rewards. Through campaigns and experience your characters can increase their skills and develop new abilities. 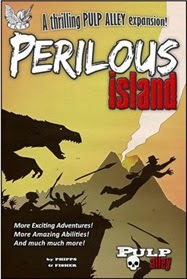 Perilous Island is one-part thrilling campaign and one-part exciting expansion. The book includes rules for creating and playing one-character leagues, new perks, 11 new scenarios, 5 new Fortune Cards, and new weird abilities. 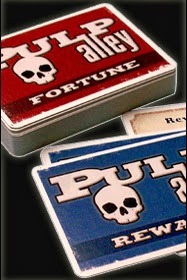 The Pulp Alley Fortune Cards are premium 310gsm plastic coated (linen) playing cards. Each deck also comes with a sturdy plastic case – worthy of protecting your Pulp Alley cards. In addition to the basic 45 Fortune cards and 5 Reward cards, the deck includes 2 blank Fortune cards and 2 blank Reward cards. These blank cards may be used for replacements, designing your own cards, red-herrings, and so on. The main reason we want to stock Pulp Alley is quite simple - it's a great game. However, it also fits will the style of characters I've been creating for Statuesque Miniatures. From Foxy and her Kill-Team to Rosa and the Resistance girls, in my head they're all larger than life, heroic characters from a dodgy B-movie, and Pulp Alley is perfect for capturing that on the tabletop. Pulp Alley is not limited to portraying pulp-era games set in the '30s and '40s, it's prefect for anything from sci-fi to fantasy - any setting where the characters are heroic, the plot improbable and the action cinematic! If you're tempted by Pulp Alley, but want to try out the rules first, the Quick Start rules are available to download from Wargames Vault. In addition, you can find great support and information from Dave and Mila -the father and daughter team behind Pulp Alley- on their Pulp Alley Forum. They are also active on the Lead Adventure Forum, where many players are already enjoying Pulp Alley games and are posting their leagues, game reports and reviews of the game. What about Pulp Alley miniatures? I've got to admit I'm intrigued and of course speculating what the co-op might be. Personally I'm hoping for a 40s/50s Noir thing... but whatever it is promises to be good. Can't wait to hear more! This a cracking game, Dam good fun! !